Does anyone else feel like today is January 356th? This month has felt immeasurably long for some reason (maybe I’m just mourning Christmas), but we’re finally about to start a brand new month in just a couple days time. Are you as ready for February as I am? One of the best parts about this second month of the year, of course, is Valentine’s Day! John and I rarely make a big deal about the holiday, but it’s still nice to have something festive and sweet to look forward to after a busy start to the new year. Keep scrolling for a roundup of Valentine’s Day themed gifts to consider in case you’re shopping for the “Galentines” in your life—or, better yet, send a link to this post over to your honey so he or she can shop for you from the collection of goodies! What caught your eye from the list above? I personally would love to unwrap that pretty bracelet or heart-shaped pillow come February 14. 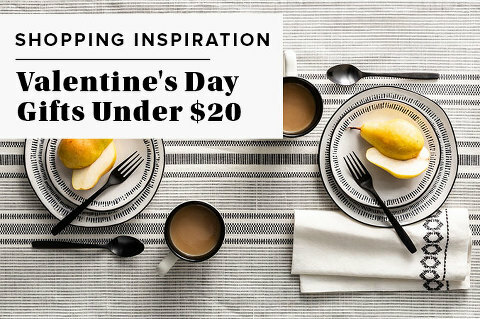 Oh, and don’t worry if you’re more of a “no gifts” Valentine’s Day participant because I’ve got plans to share a super low-key dinner-for-two type of post next week that should give you lots of lovey dovey inspiration for celebrating at home on a budget.